In his fine essay for the gorgeous new two-disc reissue of Bicycle Thieves, Godfrey Cheshire claims that Vittorio De Sica’s neo-realist classic and Orson Welles’ Citizen Kane are the “twin fountainheads” of modern cinema. From Welles came a cinema of egotism and personal expression; from De Sica, a cinema of collective conscience and social concern. Watching the film today, it’s remarkable to see how certain ideas that were completely radical at the time—the documentary-like location shooting, the non-professional actors, the bare-bones simplicity of the story—have since become the common language of “the real.” And yet Bicycle Thieves, along with maybe Roberto Rossellini’s Open City before it and De Sica’s Umberto D a few years later, remains pure and bracing, an indelible look at postwar Italy through the eyes of a man whose slow-burning desperation finally, tragically robs him of dignity. Though Americans generally know the film as The Bicycle Thief, the Criterion edition restores the proper translation of the title, which better suggests the story’s cruel symmetry. As the great French theorist André Bazin noted, the premise wouldn’t warrant “two lines in a stray-dog column”: In a Rome crippled by mass unemployment, Lamberto Maggiorani scores precious work pasting movie posters to city walls, but the job requires a bicycle, and when Maggiorani’s is stolen, he and his son Enzo Staiola search for the thief. At stake is nothing short of his family’s survival, and when his investigation yields no justice, Maggiorani has to make a heartbreaking compromise. 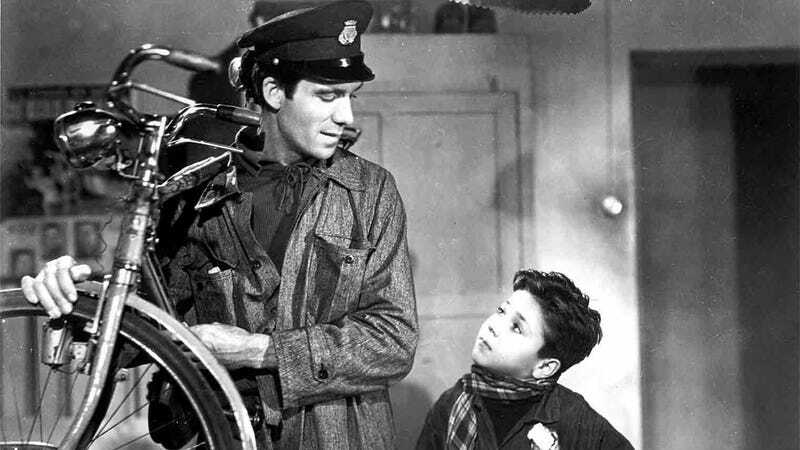 In spite of its stripped-down trappings—which have always been a little overhyped, given the film’s significant production values—Bicycle Thieves gains much of its power from De Sica’s exceptional gifts as an image-maker. Aside from the justly famous climatic sequence, countless shots are editorials in themselves: The tower of hocked goods where Maggiorani’s wife pawns their linens for lire; the exchange of looks between Staiola and a privileged boy at a restaurant; the sea of bicycles parked mockingly outside a stadium. For De Sica, it’s a damning record of the fallow period before the postwar economic recovery, and a call for change so plain and stark that only the stone-hearted could leave unpersuaded. Key features: The supplemental second disc includes new interviews about working with De Sica, a documentary on screenwriter Cesare Zavattini, and a history of Italian neo-realism, but the essays and remembrances in the 75 pages of liner notes are particularly illuminating.